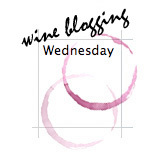 The challenge of this wine blogging wednesday was to get wines which suites the theme the wild Walla Walla wine woman Catie announced on her blog. First step was to call the winemerchants in the city to ask for a wine from Walla Walla. Hallo Sir, I`m looking for a wine from the Walla Walla distirict? Walla Walla, thats a winearea situatet in Washington state!! Sorry, never heard about, we’ve got some nice Cabernets from Gallo. Wouldn’t this be interesting for you? Of course, it was not!! Yes, this happens if you are in germany looking for a wine from Walla Walla. It took me a few hours to check out the german onlineshops for wines from Walla Walla. At the end, after hundreds of cklicks, I decided to go for the second choice, a wine from Washington state. Again I could not manage not to buy a wine from Cold Creek, but anyway, I have never tastet Cold Creek, nor Washington Cabernets at all, so I went for it. My first impression of Washingeton wines, the winerys in Washington state must be fantastic rich, of course the prices for this two wines are more than shocking. About €24/$31 each!! In fact, the wines has been quiet nice, well balanced and still a lot potential to go some more years in the bottle. I liked the wines, I could stay with it, but unfortunately they are totally overpriced. 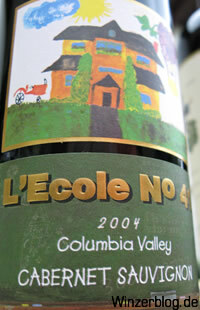 The first wine I opened was a 2004 L’Ecole No 41. Cabernet Sauvignon from Columbia Valley. As far I could understand there might be a few drops Walla Walla in the bottle. Intersting the label, I like this tractor on the left of the building 🙂 This No 41 is my favorite of this little tasting, of course I liked the freshness of this wine, very clean flavours, well balanced tannins and a well done balance of natural wineflavours and oakaroma. I believe the decision to bottle this wine unfiltered is perfect, so the delicate, clean fruity aroma densitiy is a real pleasure to enjoy. 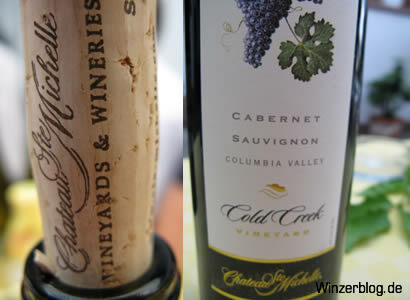 The second wine comes from Chateau Ste.Michelle, a 2003 Cabernet Sauvignon, Cold Creek, Columbia Valley. Again a nice structure of Tannin, not to hard, allready nice and soft. For my personal taste no need for further maturation, even I have been told this wine could go another 15 years. Make a nice BBQ, have some good redwineglases and go for this wine. But not allone, like the L’Ecole it is heavy in Alkohol 14.5 % vol. but this is what we are expecting in Germany when its coming to a wine from USA. Really surprising for me was the fact, both wines weren’t overpowered by Flavors of new oak, still you could enjoy the clear flavors of Cabernet Sauvignon. One word about the onlineshop where I bought this wines, the information you get about the wines, the winery and even the winemakers are really outstanding. At the end, ist was a real pleasure to learn about wines from Washington state. By now I’m curios about wines from Walla Walla, I will keep my eyes open for a 100 % Walla Walla wine. Da hat man ohnehin wenig Zeit, dann kommt jetzt auch noch die Bundesliga dazu! !